Earl Gilmore on the left and an associate pose with a tanker that may have only been used for promotional needs. It is outlined in neon and I wonder if it may have possibly had an on board generator to power the lighting. Maybe one of our readers knows more about this very unique truck? 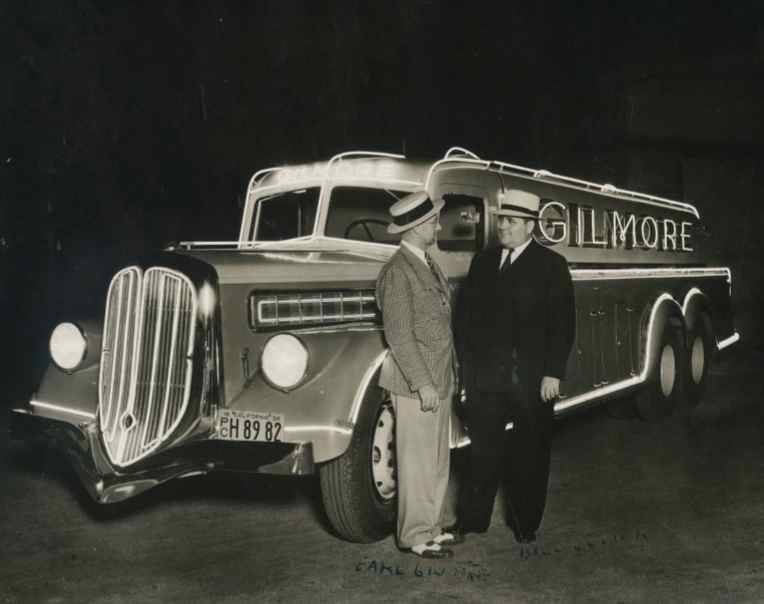 Gilmore used racing to promote his oil company and built Gilmore Stadium in Los Angeles and is also considered to be the father of midget auto racing. He backed Fred Offenhauser to help develop his famous 97 c.i. midget racing engine. He also sponsored sprint cars in the Los Angeles area and at Indianapolis, including Kelly Petillo’s wining 1934 entry. Photo from 1934. PS….The truck has been identified by readers over at Hemmings Blog as a 1934 Mack, follow this link to find out all of the details along with another photo. This entry was posted in Auto Racing 1894 - 1942, Gasoline stations, Trucks, Buses and Equipment and tagged Gas stations, Gilmore Oil. Gilmore were also major sponsors of Englishman John Cobb’s successful 1939 attempt on the Land Speed Record, a point which is often overlooked: contemporary American press reports refer to the car as “Railton Red Lion”, a reference to the company’s leaping lion logo, but this was almost totally ignored in Europe, where Gilmore were unknown, and the European press usually referred to it as a Napier Railton, the name it had carried in 1938. Gilmore were later absorbed by Mobil, who continued the sponsorship of Cobb in 1947, the car being renamed the Railton Mobil Special. Some writers have erroneously assumed that it carried that name before the war: this is emphatically not correct. The stunningly beautiful Reid Railton-designed car thus made three visits to Bonneville and broke the record three times: each time under a different name! matter? I would be most interested in knowing anything connected with these events.